The following is an article recently posted on a newsletter by my current employer. It's great stuff on desire and change! Check it out! Make comments! The number of years I have been working with people who are trying to change themselves and their circumstances is coming up on a quarter century. How people change is a subject of great interest to me. 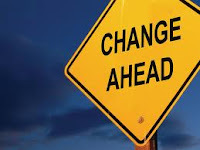 Usually a desire to change is born of practical things like pain (emotional or physical), serious problems caused by a personal flaw, threatened loss (“I can’t take this anymore!”), and an inconvenience or problem. It is more rare for an idea, vision, or dream for a better life to motivate someone to pay the price for change, but it does happen. “Divine discontent” is real. Maybe it happens more often than I think, but these kinds of folks don’t usually come to a trauma center for help. When we are confronted with one of the above, or some other pressing need for change we have a decision to make: Are we going to change OR are we going to dull the pain (usually with some form of self-medication), deny the flaw or loss, or compensate for the inconvenience, often with something that makes a bigger problem. Our lives are made up of the accumulated fallout from that repeated decision: change or suffer in various self-defeating ways. Buddha had it right when he observed pain is legitimate or illegitimate. Legitimate pain is part of living. Illegitimate pain is the result of trying to avoid legitimate pain. As most of us have learned, suffering up front, as with the process of change, in the long run prevents a great deal of unnecessary pain. For some this is a lifelong lesson waiting to be learned. It is never too late. Okay, enough philosophy. How do we find or create desires that lead to positive changes in our lives, and how do we engage those desires for real change? There are probably dozens of excellent books on this subject. I will keep it to two steps. First cultivate desire with vision. You may be motivated to change because of something negative, like off the charts stress, but you can create the desire to make needed changes in your life with something bigger, much bigger than the stress. For example, visualize or envision how your life could be very different if your life was less stressed, if you slept well at night, if you shared your burden with others, etc. You can make this vision bigger than life, vivid and colorful, something you feel and experience. Remember the subconscious cannot differentiate between real and imagined experience. The changes it causes in the body can be triggered by a graphic visualization just as easily as an experience in the real world. That may be one of the reasons Einstein said imagination is greater than knowledge. So visualize something that evokes feelings that inspire and encourage, that lead to change. Engage your vision daily, a few minutes will do. Next, act. Once you have a desire being born with vision, start doing things to keep the dream alive. Here is where the application of William James’ maxim comes in: “It is easier to act yourself into the correct way of thinking, than to think yourself into the correct way of acting.” This is a challenging stage of change. A couple of suggestions here may help. Try to make the new habit you are implementing enjoyable enough to be self-perpetuating. If you are going to start exercising (strongly advisable by the way) make the exercise something you find fun, or at least do something enjoyable while you exercise, like reading a book or watching a movie. Make the behavior you do, in a small enough dose that you can sustain the behavior over the next month or so. That’s about how long it will take for the behavior to become part of you, a habit. Positive habits (or negative), and change, require repeated behaviors over time.